SMN report: The 1950s decade was an amazing era for technical progress. Fuelled by the demands of Cold War politics, civil and military advances went hand in hand, with aviation in particular going from straight-wing slowpokes to Mach 2 skyblazers. And that progress was matched by events on the highway, for it was the age of the Detroit dream car. Every auto show displayed amazing vehicles, many of them taking their inspiration directly from the fast jets screaming overhead. 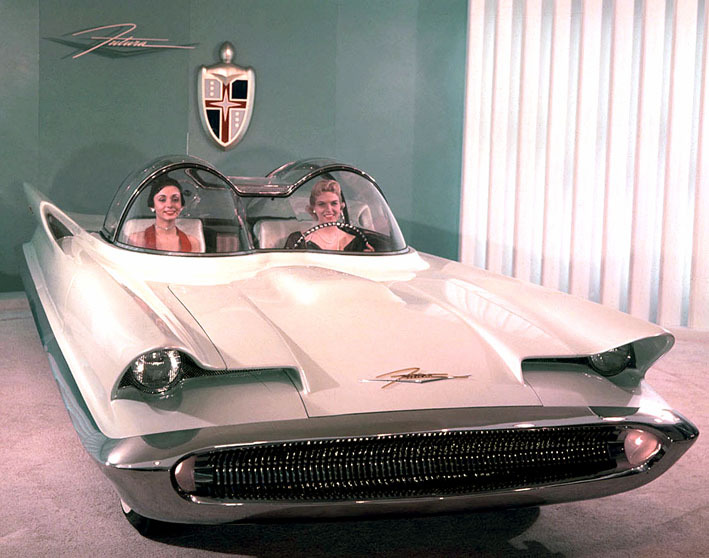 One of the finest of those dream cars was the Lincoln Futura, described at the time as ‘A 250,000 Dollar Laboratory on Wheels’. The fold-back bubble canopies looked absolutely great, as did the hooded headlights and shark-mouth grilles front and rear. Under the sleek bodywork, the Futura was powered by a modified V-8 engine, and supported by a tubular steel chassis. This reissue of the original 1956 kit (above, below) takes you back to Revell’s heyday, at least where box art was concerned. 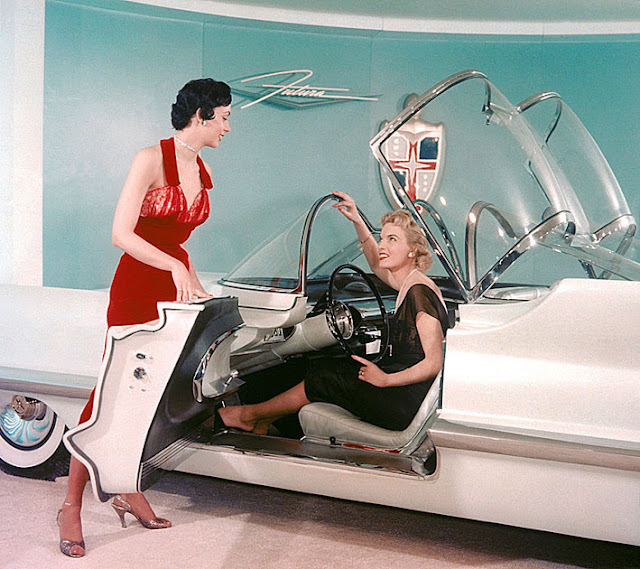 Seated in the Futura are a handsome guy and gal, both smiling under the glasswork. And the pair of them were sculpted beautifully by Revell’s best toolmakers. He's wearing a sort of casual evening jacket, while she’s in a very fetching halter-top and diamond-patterned slacks. The main components have survived the years well, though fit and finish are somewhat hit and miss. The kit has a multi-component bodyshell, which is hard work compared with today’s norm of a one-piece monocoque. The canopy is also moulded in one piece, which is a bit of a shame - it would be so cool if each bubble opened like the real thing. The Futura's tyres are each supplied in two polystyrene halves, which is a real golden-oldie oddity. However, with careful painting the end result can be OK. Even so, it’s a reminder of how far things have moved on since those early years of plastic kits. Who expects a tyre made of anything but rubber or vinyl these days? As is often the case with kits from this era, scale turns out to be something of a fit-the-box item. In this case, using information from the Revell instruction booklet that indicates a wheelbase of 10 ft 6 in (3.2 m) we get a pot-luck scale of 1:27. 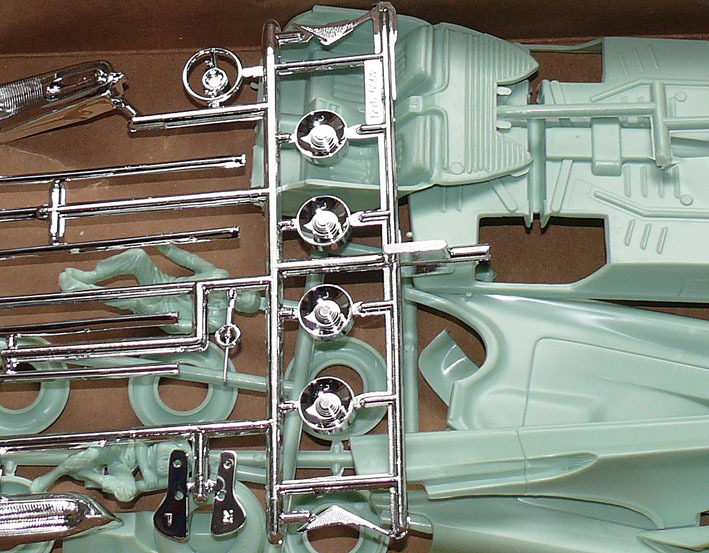 The 1:27 scale is somewhat weird, but perhaps the Lincoln Futura could be parked in a 1:32 collection without too many misgivings. Failing that, it would look impressive as a standalone diorama display piece. The real thing was a winner for publicity pix (below) as were the ladies sitting in the cockpit. Bubble canopies were all the rage at this time. 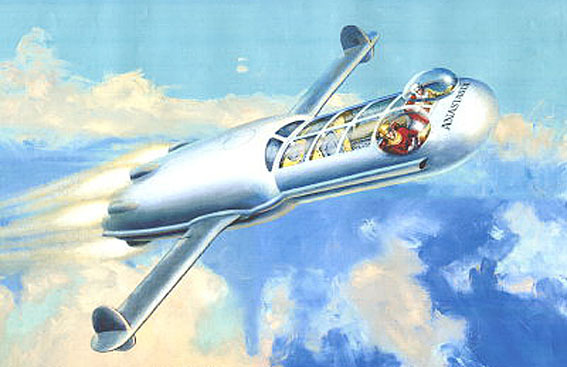 The Gerald Palmer painting (below) of Anastasia, space hero Dan Dare’s private spacecraft, was featured regularly in the pages of the British Eagle comic. 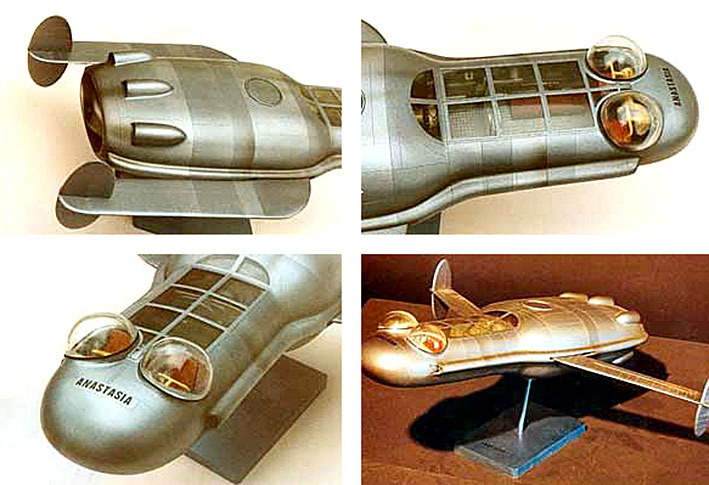 The model (below) is a one-off, made by FX expert Martin Bower. 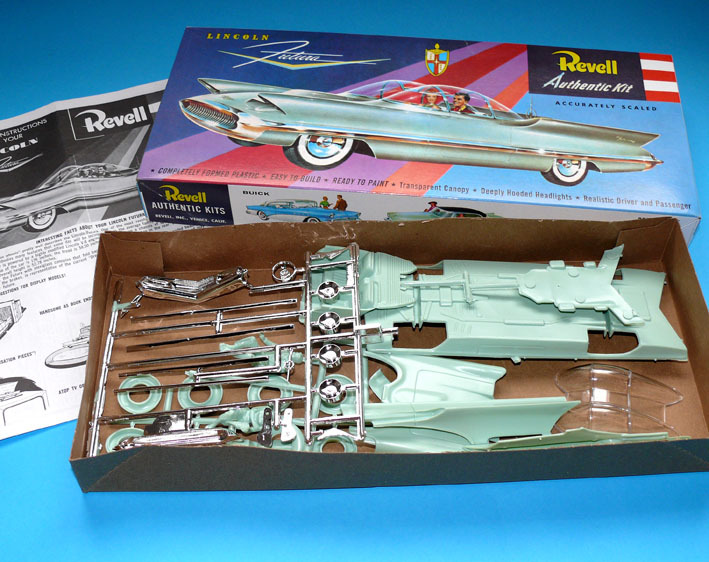 The Revell Lincoln Futura is definitely one for connoisseurs of the retro-style era, but if that’s you, it’s a hugely rewarding kit to have in your collection. The gorgeous box and instruction booklet alone are worth the price of entry. Availability is not easy, but kits come up from time to time on eBay and other internet sites. We looked at this kit’s Batmobile connections here.